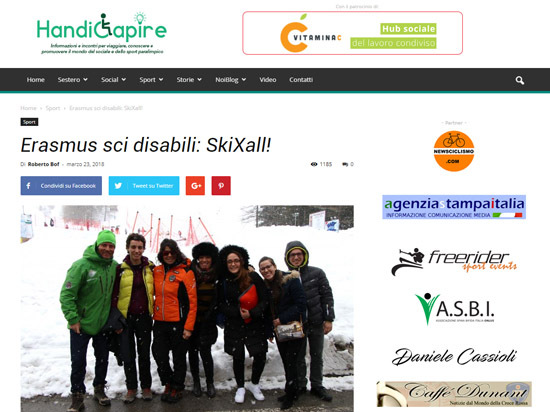 SKI4ALL is an European Project of the Erasmus+ Sport program based on a small collaborative partnership which involves four countries: Italy, Poland, Czech Republic and Belgium. Six different organisations collaborate around the themes of sport, disability, education and social inclusion. Following the Europe 2020 Strategy objectives, the project wants to promote inclusive growth and tackle the problem of early school drop-outs. The project is specifically built for youth, respecting the Inclusion and Diversity Strategy, supporting the participation and inclusion of young people with disabilities. The project is focused on the importance of health-enhancing physical activity through an equal access to sport for everyone, ski in particular. With the creation of guidelines for teachers, coaches and trainers in schools, we will promote the physical activities of children with and without disabilities. Through a rich Methodology full of content that’s been tested by FreeRider and the other partners, teachers, technicians and coaches will get the qualification required to deal with the special needs of people with disabilities, involving all the students. With SKI FOR ALL we would like to facilitate the conditions of children with disabilities to practice grassroots sport, through the use of adequate facilities, equipment and appropriate training. SKI FOR ALL has the purpose to strengthen school teachers and ski coaches competences enforcing a better sport culture inside schools and in the whole European community. The model will be tested on a pilot experience inside a Winter Sport Camp and implemented in 3 countries. Trough learning activities, every Country will implement the methodology within schools, where at least 3 schools will collaborate in a way that around 30 young with disabilities will benefit. On parallel, good experiences and practices will be collected in order to set the parameters to replicate the guidelines at the European level, thanks to the international network of IFSBH. Let’s have fun together with the SKI4ALL!